108 min. Universal Studios. Directors: Christophe Lourdelet, Garth Jennings. Cast: Matthew McConaughey, Reese Witherspoon, Seth MacFarlane, John C. Reilly, Taron Egerton, Scarlett Johansson, Tori Kelly. A vaudeville theatre upholstered in red. A menagerie of animals and warm-fuzzies performing cover versions of popular music. An optimistic impresario (barely) holding it all together. You can't fool me, you say...that's The Muppet Show, the 1976-1981 television classic. Well, sure, but it's also Sing, the 2016 CGI-animated worldwide blockbuster. Sing serves up a post-American Idol, post-The Voice salute to old-fashioned variety that could also fairly be described as a kinda lazy kiddie jukebox musical, a Glee-esque karaoke of the stars. And although Sing may not be an original musical like, say, Moana, it will put smiles on kids' faces all the same. Sing continues a modern trend of pairing an animation director—in this case, first-time feature director Christophe Lourdelet (who last worked on Despicable Me 2)—with a live-action director—in this case, Garth Jennings (The Hitchhiker's Guide to the Galaxy), also the film's screenwriter—to boost the cinematic aesthetic and win greater crossover appeal with adults. Flashy, swooping "camera" moves, a few choice movie-star voices, and near-wall-to-wall music (the music credits number at seventy) add energy to a story set in a Zootopia-style big city populated entirely by animals, but somehow Sing remains steadfastly generic, with precious few precious exceptions to keep discerning audience members on the hook. In his second prominent 2016 voice role (the other being in Kubo and the Two Strings), Matthew McConaughey stars as koala bear Buster Moon, the always hustling proprietor of the Moon Theater. His latest scheme to balance the books and save the theater: a singing competition. The only problem is that he accidentally promises (thanks to a typo by one-eyed reptile assistant Miss Crawly) a $100,000 grand prize that Moon can't back up. The prize money draws a crowd of music-loving strivers looking to escape their lives of quiet desperation: porcine housewife Rosita (Reese Witherspoon), harried mother to a brood of 25 piglets; crooner Mike (Seth MacFarlane), a mouse who fancies himself a member of the Rat Pack; punk-rocking porcupine Ash (Scarlett Johanssen); insecure teen elephant Meena (singer Tori Kelly); and "soulful" gorilla Johnny (Taron Egerton), son of a Cockney gangster. Turn off your critical faculties, and Sing is pleasant enough (though it made this adult sleepy both times he watched it), but scrutinize it, and you'll find that it's neither very musically accomplished nor very funny. The tone is bright and colorful but still evinces a kind of joyless duty, mostly lacking in Muppet-y comic invention (exceptions: the "blackout gag" of a snail perched on a microphone singing "Ride Like the Wind" and the running gag of J-pop raccoons who fail upward because their lack of English comprehension means they don't know they're being rejected). Too many sequences qualify only as narrative deadwood propped up with overplayed pop (most egregious: Rosita dancing to the Gipsy Kings' "Bamboleo" in a grocery store). Occasionally the movie connects with a musical choice as a character choice (in spite of myself, I enjoyed Egerton's Elton John impression with "I'm Still Standing"—who knew the kid had pipes?) or a vocal win (Jennifer Hudson squeezing poignancy from the Beatles' "Golden Slumbers/Carry That Weight," Sing's nostalgia-tinged dream anthem). Moon articulates for kids the film's sole, simple sermon, the pithy pep talk "Don't let fear stop you from doing the thing you love." And hey, Sing provides the excuse for Steveie Wonder to provide his first song for a major film release since Jungle Fever a quarter-century ago (the catchy "Faith," featuring Ariana Grande). So there are certainly worse movies to babysit your kids for a couple of hours...but there are also plenty of better ones. 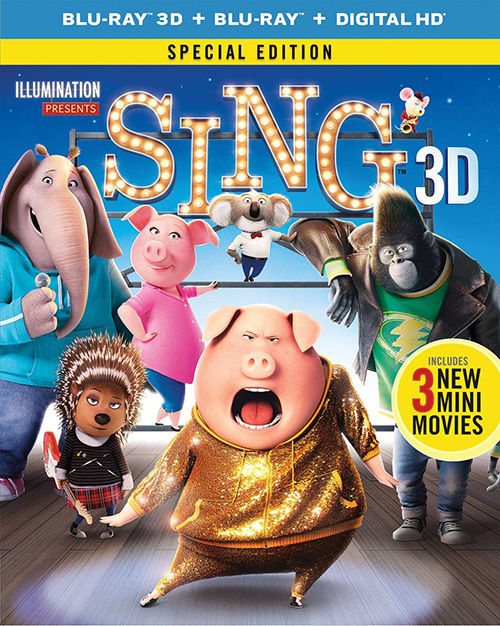 Universal belts out Sing in a Blu-ray 3D + Blu-ray + Digital HD special edition marked by fantastic A/V and a diverting collection of extras. 3D doesn't always provide significant added value, but in the case of this pop musical, the 3D adds noticeable visual pop. The film's "camera" has a tendency to plunge through the city, moments that take on extra oomph in 3D. Depth of field is palpable even in static scenes, with multiple planes apparent within various interiors. The shaping of the characters' three-dimensional contours also adds a sense of heightened reality: for those who love CGI animation, 3D is the way to experience it at its full design advantage. The 3D transfer has a touch of aliasing and gets a very slight downgrade from the 2D version in sharpness of detail and brightness of hue. That said, both transfers (and both are indeed included in the 3D combo pack) look terrific, and the 3D gets the bump as the definitive presentation. As for the state-of-the-art, lossless Dolby Atmos 7.1 mix "remixed specifically for the home theater environment," it's mighty impressive. The idea behind Atmos is to "place and move audio anywhere in the room, including overhead." Obviously, it take pretty finely tuned ears to discern the difference between any other lossless mix and an Atmos one, but it's hard to imagine a more full aural presentation than the one afforded the film here. Music takes on the most powerful presence, for obvious reasons, but dialogue is always clear, and the urban zoo sound effects (including a helicopter effect that shows off the "overhead" of Atmos) arouse the ears. First up among the extras are three Mini-Movies: "Gunter Babysits" (3:47, HD), with Gunter watching Rosita's children; "Love at First Sight" (4:18, HD), with Miss Crawly exploring online dating; and "Eddie's Life Coach" (4:16, HD), who is Eddie's mother. These also come with "The Making of the Mini-Movies" (5:56, HD). Bonus features include "The Making of Sing" (4:40, HD), which crams a fair amount of sound bites into a paltry running time, and the self-explanatory (and even shorter) "Finding the Rhythm: Editing Sing" (2:44, HD). Character Profiles (12:25 with "Play All" option, HD) comprise "Matthew McConaughey as Buster Moon," "Reese Witherspoon as Rosita," "Tori Kelly as Meena," "Taron Egerton as Johnny," "Nick Kroll as Gunter," and "Garth Jennings as Miss Crawly." We get the "Music Video 'Don't You Worry 'Bout a Thing'" (3:11, HD) as well as "Making a Music Video with Tori Kelly" (2:52, HD), the "Music Video 'Faith'" (2:46, HD), the "Lyric Video 'Faith'" (2:49, HD), the "Lyric Video 'Set It All Free'" (3:40, HD), and "Sing & Dance! - 'Faith'" (6:31, HD), a dance tutorial to accompany the video. The five-part The Sing Network (1080p) serves up faux ads and a news broadcast: "Gunter's Dance Studio" (1:22, HD), "The Moon Theater" (0:43, HD), "Rosita's Babysitting Gizmo" (1:03, HD), "Miss Crawly's Matchmaking Service" (0:55, HD), and In the News (9:09 with "Play All" option, HD), with "Buster Moon," "Gunter," "Rosita," "Johnny," "Meena," "Ash," and "Mike." Lastly, "The Best of Gunter" (1:03, HD) is a clip reel culled from the film. All site content © 2000-2019 Peter Canavese. Page generated at 04/17/2019 11:46:45PM.